Mary, Queen of Scots, also known as Mary Stuart or Mary I of Scotland, reigned over Scotland from 14 December 1542 to 24 July 1567. Sir George Throckmorton of Coughton Court was an English politician and a member of Parliament during the reign of Henry VIII. Born by 1489, he was the eldest son of Sir Robert Throckmorton of Coughton Court by Catherine Marrow, daughter of Sir William Marowe or Marrow, Lord Mayor of London. Coughton Court is an English Tudor country house, situated on the main road between Studley and Alcester in Warwickshire. It is a Grade I listed building. Alcester is a market town and civil parish of Roman origin at the junction of the River Alne and River Arrow in Warwickshire, England, approximately 8 miles (13 km) west of Stratford-upon-Avon, and 8 miles south of Redditch, close to the Worcestershire border. The 2011 census recorded a population of 6,273. 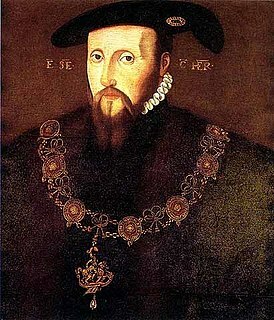 Edward Seymour, 1st Duke of Somerset, was Lord Protector of England during part of the Tudor period from 1547 until 1549 during the minority of his nephew, King Edward VI (1547–1553). Despite his popularity with the common people, his policies often angered the gentry and he was overthrown. He was the eldest brother of Queen Jane Seymour (d. 1537), the third wife of King Henry VIII. Maldon is a constituency represented in the House of Commons of the UK Parliament since 2010 by John Whittingdale, a Conservative. Devizes is a constituency in Wiltshire, England, which is represented in the House of Commons of the U.K. Parliament and includes four towns and many villages in the middle and east of the county. The area's representative has been a Conservative since 1924. The Battle of Pinkie Cleugh, sometimes known as the Battle of Pinkie, took place on 10 September 1547 on the banks of the River Esk near Musselburgh, Scotland. The last pitched battle between Scottish and English armies, it was part of the conflict known as the Rough Wooing, and is considered to have been the first modern battle in the British Isles. It was a catastrophic defeat for Scotland, where it became known as Black Saturday. A knight is a man granted an honorary title of knighthood by a monarch, bishop or other political or religious leader for service to the monarch or a Christian church, especially in a military capacity. Historically, in all Europe, knighthood was conferred upon mounted warriors. During the High Middle Ages, knighthood was considered a class of lower nobility. By the Late Middle Ages, the rank had become associated with the ideals of chivalry, a code of conduct for the perfect courtly Christian warrior. Often, a knight was a vassal who served as an elite fighter, a bodyguard or a mercenary for a lord, with payment in the form of land holdings. The lords trusted the knights, who were skilled in battle on horseback. 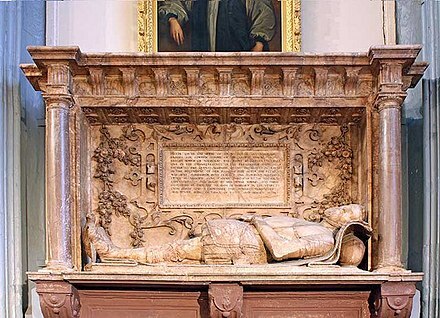 Throckmorton married Anne Carew, daughter of Sir Nicholas Carew, a Knight of the Garter and his wife Elizabeth Bryan, and they had 10 sons and three daughters. Their daughter Elizabeth became the wife of Sir Walter Raleigh. After his death, Anne married Adrian Stokes, the second husband, and former Master of Horse of, Frances Brandon, Duchess of Suffolk. ↑ T.B. Howell (ed. ), (Cobbett's) A Complete Collection of State Trials, Vol. I (Longman, Hurst, Rees, Orme & Brown, London 1816), pp. 869 ff..
↑ V. Smith, 'Perspectives on Female Monarchy', in J. Daybell & S. Norrhem, Gender and Political Culture in Early Modern Europe (Abingdon, 2017), 145. James Hepburn, 1st Duke of Orkney and 4th Earl of Bothwell, was a prominent Scottish nobleman. He was known for his association with, abduction of, and marriage to Mary, Queen of Scots, as her third and final husband. 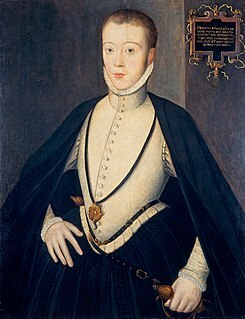 He was accused of the murder of Mary's second husband, Henry Stuart, Lord Darnley, a charge of which he was acquitted. His marriage to Mary was controversial and divided the country; when he fled the growing rebellion to Scandinavia he was arrested in Norway and lived the rest of his life imprisoned in Denmark. 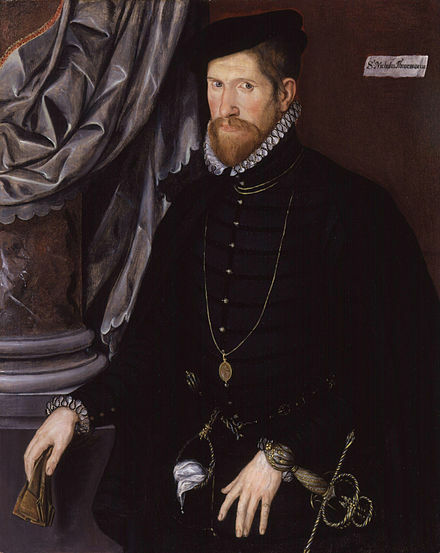 Sir Francis Throckmorton was a conspirator against Queen Elizabeth I of England in the Throckmorton Plot. William Maitland of Lethington was a Scottish politician and reformer, and the eldest son of poet Richard Maitland. The Casket letters were eight letters and some sonnets said to have been written by Mary, Queen of Scots, to the Earl of Bothwell, between January and April 1567. They were produced as evidence against Queen Mary by the Scottish lords who opposed her rule. In particular, the text of the letters was taken to imply that Queen Mary colluded with Bothwell in the murder of her husband, Lord Darnley. Mary's contemporary supporters, including Adam Blackwood dismissed them as complete forgeries or letters written by the Queen's servant Mary Beaton. The authenticity of the letters, now known only by copies, continues to be debated. 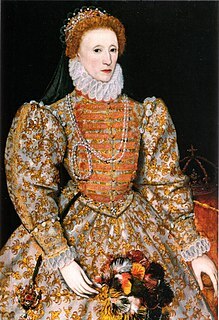 Some historians argue that they were forgeries concocted in order to discredit Queen Mary, and ensure that Queen Elizabeth I supported the kingship of the infant James VI of Scotland, rather than his mother. The historian John Hungerford Pollen, in 1901, by comparing two genuine letters drafted by Mary, presented a subtle argument that the various surviving copies and translations of the casket letters could not be used as evidence of their original authorship by Mary. Kirk o' Field in Edinburgh, Scotland, is best known as the site of the murder on 10 February 1567 of Lord Darnley, second husband of Mary, Queen of Scots, and father of King James VI. The site was occupied by the collegiate church of St Mary in the Fields, or the Kirk o' Field. It was approximately ten minutes' walk from Holyrood Palace, adjacent to the city wall, near to the Cowgate. The site is close to the location of the National Museum of Scotland. Thomas Randolph (1523–1590) was an English ambassador serving Elizabeth I of England. Most of his professional life he spent in Scotland at the courts of Mary, Queen of Scots, and her son James VI. While in Scotland, he was embroiled in marriage projects and several upheavals. In 1568-1569 he was sent on a special embassy to Russia, visiting the court of Ivan the Terrible. The Battle of Carberry Hill took place on 15 June 1567, near Musselburgh, East Lothian, a few miles east of Edinburgh, Scotland. 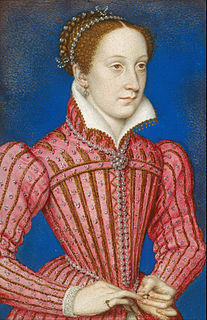 A number of Scottish lords objected to the rule of Mary, Queen of Scots after she had married the Earl of Bothwell, who was widely believed to have murdered her previous husband Lord Darnley. The Lords were intent to avenge Darnley's death. However, Bothwell escaped from the stand-off at Carberry while Queen Mary surrendered. Mary abdicated, escaped from prison, and was defeated at the battle of Langside. She went to exile in England while her supporters continued a civil war in Scotland. Alexander Cunningham, 5th Earl of Glencairn was a Scottish nobleman and Protestant reformer, prominent in the Scottish Reformation. Sir Henry Killigrew was an Cornish diplomat and an ambassador for the Kingdom of England in the sixteenth century. He was several times employed by Elizabeth I in Scottish affairs and served as one of the English appointees to the Council of State of the Netherlands in the United Provinces in 1586 and 1587–1589. He served as a Member of Parliament for Newport & Launceston in 1553, for Saltash in 1563, and for Truro in 1571-2. Jean Hepburn, Lady Darnley, Mistress of Caithness, Lady Morham was a Scottish noblewoman and a member of the Border clan of Hepburn. Her brother was James Hepburn, Earl of Bothwell, the third husband of Mary, Queen of Scots. Jean's first husband was John Stewart, 1st Lord Darnley, an illegitimate half-brother of Queen Mary, which made Jean a double sister-in-law of the queen. Jean married three times. 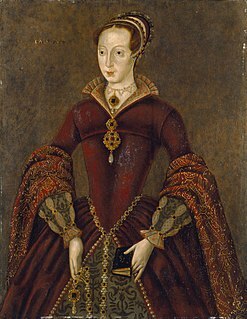 She was also Lady of Morham, having received in 1573 the barony of Morham and lands which had belonged to her mother, Lady Agnes Sinclair and was forfeited to the Crown subsequent to her brother, the Earl of Bothwell's attainder for treason. 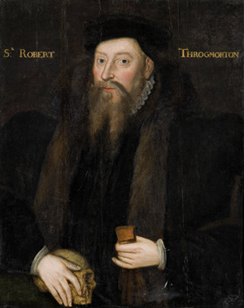 Sir Robert Throckmorton of Coughton Court, Warwickshire, MP, KG was a distinguished English Tudor courtier. His public career was impeded by being a Roman Catholic. John Elder was a Scottish cartographer and writer. He was the tutor of Henry Stuart, Lord Darnley in England. George Seton V, 7th Lord Seton (1531–1586) was a Lord of the Parliament of Scotland, Master of the Household of Mary, Queen of Scots and Provost of Edinburgh. He was the eldest son of George Seton, 6th Lord Seton and Elizabeth Hay, a daughter of John Hay, 3rd Lord Hay of Yester. His childhood and schooling were in France. Bastian Pagez was a French servant and musician at the court of Mary, Queen of Scots. He devised part of the entertainment at the baptism of Prince James at Stirling Castle in 1566. When Mary was exiled in England, Bastian and his family continued in her service. The 19th-century historian Agnes Strickland considered his court role as equivalent to the English Master of the Revels; in England he was Mary's chamber valet and designed her embroidery patterns. Master John Wood, was a Scottish courtier, administrator and secretary to the Earl of Moray. He was assassinated on 15 April 1570. Robert Melville, 1st Lord Melville (c.1527–1621) was a Scottish diplomat, administrator, jurist, and intriguer, and uncle of the poet Elizabeth Melville. "Throckmorton, Nicholas" . Dictionary of National Biography . London: Smith, Elder & Co. 1885–1900. Chisholm, Hugh, ed. (1911). "Throckmorton, Sir Nicholas" . Encyclopædia Britannica . 26 (11th ed.). Cambridge University Press. p. 891. Wikimedia Commons has media related to Nicholas Throckmorton .